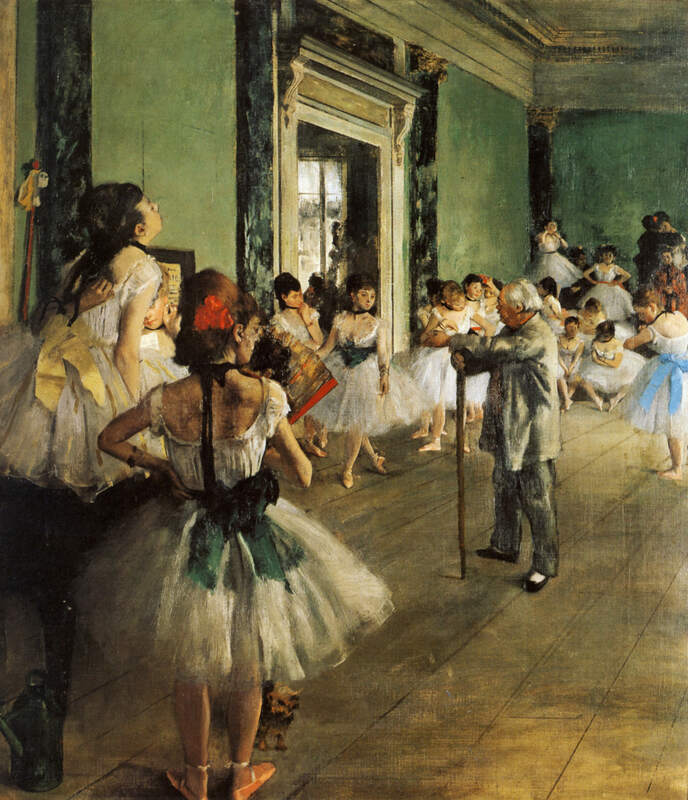 Though Degas had been treating the subject since 1870, this is his first fully accomplished ballet work. It was painted in two stages: from late 1873 to mid-1874 and then in 1875-6, when it was substantially reworked. There is a variant in the Metropolitan Museum in New York. X-ray photographs and associated drawings reveal that the painting originally showed the foreground dancer with a fan posed looking out at the viewer and leaning against the piano, while the unidentified dance master was seen from the back. Some features of this original dancer can be seen beneath the present one: the dark brown patch on the fan was originally part of the hair of the first figure. The anonymous figure of the dance master was replaced with that of Jules Perrot, whom the artist had probably first met in 1874. Perrot had been a famous dancer at the Opera and had also worked in Russia, before later becoming a teacher. Degas thus transformed the original work into a kind of homage to Perrot, turning the foreground dancer away from the viewer so as not to distract from his figure. Her present position, watching Perrot, serves to direct the eye towards the centre. This reworking of the image is typical of Degas' laborious method, and signs of alteration are also evident in many other works. The setting was probably a room in the old opera house in the rue Le Peletier, which had burnt down in 1873. Though supposedly a class, hardly any of the dancers are actually paying attention to Perrot. The dancer in the foreground, seated on the piano, is scratching her back, while the one at the far end of the room above the rest is adjusting her choker. Most of the others are similarly distracted. In the background, to the right, can be seen some of the dancers' mothers, while the small dog in the foreground adds a further incidental detail.